This post was written by guest author Samantha Casey. Find out more about Samantha below. The world of business zooms by us like a NASCAR racer going for the win. It’s quick, and, if you don’t pay attention, you’ll miss intricate details. 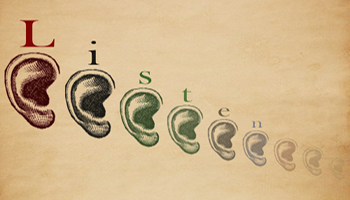 Listening effectively is critical not only for your audience, but for your benefit as well. When you present yourself as an effective listener, you are able to better understand the wants, needs, and workings of your clientele, business partners, audience, and associates. So, what makes one an effective listener? The two ears, one mouth ratio. Speak less, listen more. Sounds easy, however, effective listening takes a genuine effort. It may appear profound to fathom the idea of talking less, but when doing so it enables you to listen in a manner that helps you interpret what you are hearing in a more effective way. For example, if a potential client is telling you about their recent experience with a business coach who ignored their emails, didn’t answer pertinent questions, and neglected their requests; these are signals telling you what your client sees as important when working with a professional. If you are listening effectively, you will be notating these points and beginning to prepare a response that assures your potential client they are in great hands working with you. You address their concerns and offer ways to demonstrate how you will make them feel comfortable under your care. If you are not listening effectively, you are most likely checking your Blackberry, thinking about the day’s agenda, and eager to end the call so you can forward them an invoice. Notice the difference…it’s incredible and can affect your business success. When you take on the mentality that you want to listen to understand, you are opening yourself up to engaging more with your audience. You are now present with them and, this can help you zoom in on important details that may have been overlooked otherwise. These details can often be so intricate that, when not effectively listening, you’d skim right over them. However, those are often the details that can make or break a business deal, future partnership, or new client signing on to work with you. The idea of the two ears one mouth ratio is to demonstrate that we have twice as much listening capability as we do speaking. Therefore, it is in our best interest to exercise this capability so we can better our business practices and grow our empires. Prepare and seek to understand – Begin with a clear mind, eliminating all other distractions, (Blackberry, crowded room, checking emails, driving, etc) before beginning your call/meeting. Start with the intent to listen with a mindset that says you are focused on your audience and what they are verbally relaying to you. Hold your response – So often we already have in our minds what we want to say in response, that we aren’t listening to our audience because we are so eager to speak. Give yourself the chance to fully engage with your audience before responding. Hear them out before you reply. You may surprise yourself by finding that the original response you were thinking of is different based on what you are now hearing. Hold judgments/analyzing – It’s easy to already have a judgment of your audience before you finish your call/meeting. Sometimes, you may find yourself already mentally predicting their response. Try to keep these thoughts at bay until you have completed your conversation, then return to review your initial judgments/analyzations. You may find your initial findings conflict with your current findings. Utilize note taking and/or a recording device – It’s wonderful to feel like we can remember every detail of every conversation we have. Save yourself the time and challenge of having to do this through utilizing note taking or a recording device for your calls/meetings. Both methods will help you stay organized, retain important information, and will keep pertinent ideas fresh in your mind. If you find you are more of a visual person, take advantage of the note taking. If you are more audio driven, grab a recording device. Paraphrasing – Paraphrasing is taking what you have heard and using your own words to convey what you feel you’ve heard and understood. It’s a way of summarizing the conversation in words you feel comfortable using. Practicing this also helps you to recall important conversation points and show your audience you were engaged in the conversation. In addition, it supports you as it verbally helps you to continue to understand and interpret the conversation you are engaged in. Effective listening is an ongoing, important part of business practice. Let the tips above help guide you through effective listening methods that will continue to benefit you and your audience. Samantha Casey is the founder and operator of Relentless Consulting Group, a firm that helps businesses and individuals market to the world. She is a blogger, reader, and networker with a passion for helping others and building strong brands. Follow Samantha on Twitter to find out more about her.